Home » 360 Camera Discussion » 5 reasons why the VIRB 360 will be the most popular 360 camera EVER! The VIRB 360 is a brand new 360 camera being developed by Garmin and I think it will be the best consumer 360 camera ever. A bold statement, but I think I can back it up even before the camera has been released. When the VIRB was announced a few weeks ago, it took me completely by surprise. It has all the features I could want in a 360 camera, and some that I had never even thought of! But was it all too good to be true? Some 360 cameras have promised bit things but have failed to deliver (cough, Nikon Keymission 360). Thankfully it didn’t take long for some test footage of the VIRB 360 to appear online, and at that point I knew my strong first impressions were justified. So why the hype? Here are the reasons why I think the VIRB will be the most sought after 360 camera ever. A few years ago, the highest video resolution we could get out of the first 360 cameras was a paltry 1980 x 1080. This resolution made viewing 360 video an ugly task and took us back to the late 90’s era of blurry, pixalated video. It wasn’t long, however, till the first 2K 360 camera appeared, then 3K, then 4K. Now there are half a dozen cameras that can shoot in 4K, which still isn’t perfect, but is at least watchable. I thought it would be at least another year or two before we would see 5K 360 cameras appearing, so imagine my surprise when Garmin announces that the VIRB 360 can shoot 5.7K 360 video. 5.7K is a big step up from 4K and judging from the quality of the video I’ve seen, it will make 360 video look almost at good a HD. OK, there is a catch, when shooting in 5.7K the camera won’t be able to stitch the video together itself. You’ll need to download the video from your camera and use software such as Autopano or Skybox Mettal to stitch it together. These are premium software packages, but Garmin has indicated they will also be releasing free software that will allow you to stitch the 5.7K footage. However you stitch it, the finished product is a gloriously clear 360 video that is far and away beyond the competition. 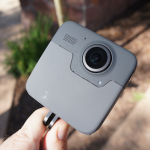 One of the most read articles on this site is my list of waterproof 360 cameras, proving there is huge demand for this feature. Until now only the Nikon Keymission 360 offered 4K quality 360 experience underwater, and that’s kind of ruined by the need to use an external case. The VIRB 360 is the first 360 camera to be completely waterproof without the need for any casing or housing and I think this will be an extremely important feature for many people buying this camera. 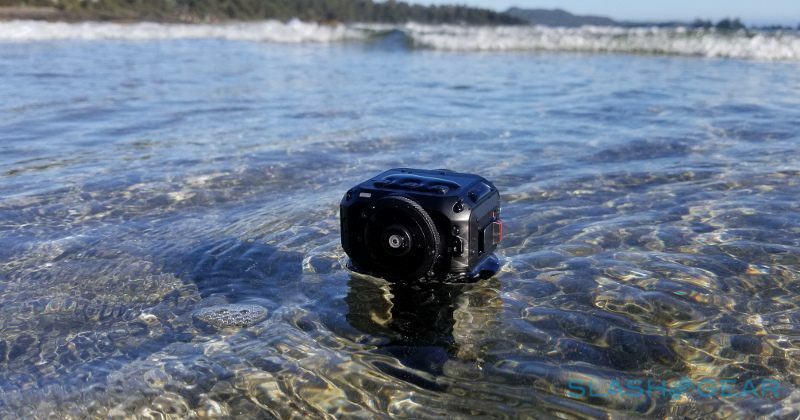 You’ll never have to worry about destroying your camera if you take it for a surf, or Kayaking, or even for a quick swim! The VIRB is waterproof to 10m, so while I wouldn’t recommend taking it deep sea diving, it should be durable enough to take some cool 360 video underwater in glorious 5K . When shooting 360 video one of the most important things to consider it keeping your camera steady. Any shakiness or too much movement can render a 360 video unwatchable, so keeping your camera still enough is difficult unless you use a professional gimbal. Thankfully stabilization software that can smooth out your video automatically (without using any extra kit) is starting to be rolled out in new cameras. I was so pleased to hear that the VIRB 360 would feature stabilization software, but upon closer examination, it turns out that the software is even more advanced than I thought possible. Not only does the VIRB stabilize your video so it’s silky smooth, but it can even tell which direction you are travelling and keep the image focused on this direction. This is important when shooting 360 video because sudden turns can disorientate the viewer; the VIRB is the first 360 camera to feature this and it really sets it apart from the competition. “OK Garmin, start recording” – that’s all you need to go to get your VIRB 360 to start recording in glorious 360. One of the most annoying aspects of action cams is the clunky interface, and having to manually press a button to start shooting is a pain once you’ve set up your camera. The voice control feature means you can set up your VIRB and use your voice to start and stop recording without having to touch the camera. Another voice command includes “remember that” which will instruct the camera to tag a specific moment. You can also instruct the camera to take photos, change mode or turn off when you’re finished. Now this really is the coolest feature that I never knew I wanted. The VIRB is able to create augmented reality overlays on your 360 video which show date from the many sensors within the camera. Speedometer, location, elevation, heart-rate, all these can displayed in a variety of attractive overlays on your video. This is a perfect feature for people who want to shoot action videos as it provides usable information to the viewer in an attractive format. Combining augmented reality with 360 video certainly sets this camera apart from the competition. I picked out 5 features unique to the VIRB 360 that I think will make it the most popular 360 camera, but the VIRB can do much more. Here are some of the other features that make the VIRB 360 an awesome camera. 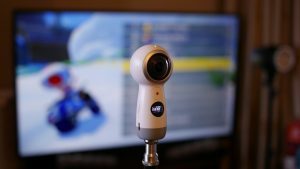 4K Livestream – The ability to live stream in 360 degrees is becoming a must have feature for new 360 cameras. Being able to share your experience live in an immersive 360 format was ot long ago considered implausible, but now it’s very much a reality! Most other 360 cameras are limited to live streaming in 2K resolution which results in below average looking video. The VIRB 360 will be able to livestream in 4K, meaning your streams will look as sharp as possible. 360 Audio – 360 audio is captured with several microphones and is designed to mimic how we hear sounds in reality. If a sound is picked up by the camera originating from its left side, when you play back the video you’ll hear it much more in your left ear than your right. 360 audio is designed to increase immersion when watching 360 video using a VR headset and few 360 cameras have this feature. Rugged and durable – The VIRB 360 is first and foremost, an action camera. 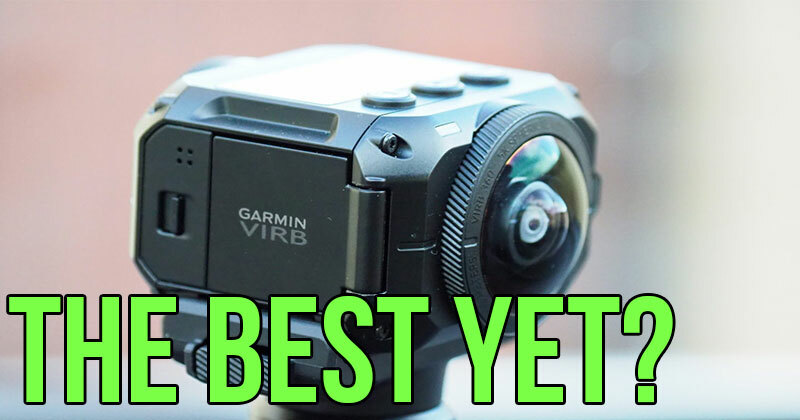 Garmin have become huge competitors to industry leaders GoPro in the action camera market, some even say they have overtaken them in terms of quality. Suffice to say, Garmin has a huge amount of experience in developing action cameras that can take a beating and the VIRB 360 is no different. The camera features strengthened glass, watertight casing and shockproof body. Even if you do manage the glass lenses, Garmin have designed the VIRB to make replacing them without tools as easy process. OK you’ve convinced me, but what’s the bad side? No camera is perfect and this applies to the VIRB 360. There are one of two issues I have when looking at the spec sheet that stop this camera being a 10/10. Short battery life – Garmin has suggested that the VIRB 360 can shoot continuously for 1 hour on a full charge. This is less than most consumer 360 cameras which tend to last for around 100 minutes. Obviously you are unlikely to be shooting continuously for an hour, but keep in mind that the battery probably won’t last you a whole day even if you have the camera off most of the time. Live stream only compatible with Apple – In order to livestream in 360 you need to connect you cmera to a phone and set up the live stream there. In this case it seems that this will only be possible using an Apple device, which seems odd as the rest of the features are fully compatible with Android. Hopefully 360 live streaming can be added in a future update. Price – The elephant in the room. Yes, the VIRB is expensive, very expensive if you compare it to other action cams. Just think about the sheer amount of features you are getting though. At $799 (£649 if you’re in the UK) it’s still a consumer prices device and it’s closest competitors in the 360 camera can cost thousands. I still think this is a good deal considering the quality and unique capabilities of the camera. As the 360 market becomes more crowded, no doubt we’ll see prices drop, but probably not by much. It wouldn’t be fair if I didn’t mention some of the VIRB 360’s top competitors, because many of them are very good cameras. This is another new 360 camera coming later this year and it’s high on my list of anticipated releases. The YI360 will also be able to shoot 5.7K resolution 360 video, making it a real competitor. On the downside, the YI360 won’t be waterproof, there will be no stabilization software and live stream is only possible at 2.5K. 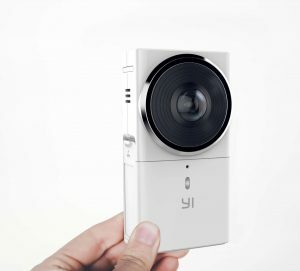 The again, the price is half that of the VIRB360, so if you don’t care much for those features the YI 360 could be a great, if less polished, option. GoPro announced their first 360 camera about a month ago, to be released later this year (exact date unknown). 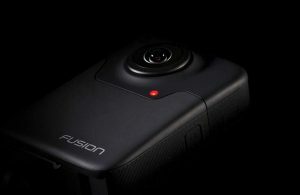 The GoPro Fusion will shoot 5.2K 360 video, which is lower than the VIRB but still way ahead of most other cameras. There isn’t much info on the GoPro Fusion yet, but if the price is low then this could be a high quality alternative from a trustworthy company. If you are looking for a waterproof 360 camera but don’t fancy spending $800, the Nikon Keymission could be for you. I personally don’t recommend the camera because of software issues which dogged the camera upon release. You’ll also have to use a special case to make it waterpoof, this reduced the quality of the 360 video. This is the budget friendly option for people who want to test our a 360 camera without investing a lot of money. At just over $200 this is one of the cheapest 360 camera and yet it can still shoot 4K 360 video, live stream and create 360 timelapse. It’s nowhere near as feature packed as the VIRB 360, but the Gear 360 is still a solid choice for newcomers to the 360 medium. In case you hadn’t guessed already, I’m VERY excited for the VIRB 360 to be released and I stand by my statement that it will be the best consumer 360 camera of 2017. There simply isnt any competition when it comes to video quality, software and the sheer number of features packed into one small, lightweight device. The price might put a lot of people off, but I know for a fact that there are huge amounts of people out there who have been waiting for a mid-range 360 camera like this to come to the market and no doubt they will snap it up once released. So if you are looking for a “prosumer” 360 camera that has pretty much every feature you could want then I highly recommend pre-ordering the Garmin VIRB 360 as I have done. The Garmin VIRB 360 will be released on the 14th of June and is available to pre-order on Amazon (click the button below). Unfortunately, your original suspicion is it, that the specs are too good to be true.